She found a mystery fly hanging in a tree along the bank of the Beaverkill River. After doing some research, she discovered that the rusted hook and discolored materials were once a famous fish-catching pattern. River therapy is the time we spend on the water. While that phrase has a different meaning for each of us, the outcome is often the same: River therapy is our quest for solitude. It’s an escape and well-needed break from our hectic lives. It is the meditative state our minds slowly slip into, cast after cast. Then, just as our subconscious minds find what we’re were longing for, we’re snapped back into reality by screaming drags and bent rods. That sounds like an even trade to me. River therapy days become the stories we swap with friends over a campfire. They stay with us as we age, and we shall be hard-pressed to forget them. Even though we strive for these days on the water, the sad reality is that they aren’t always the case; more often than we’d like to admit, we find ourselves smack in the middle of one of those “other” days. Those are the days when nothing goes right and you wonder why you bothered getting into your waders all. The afternoon I stumbled across the Renegade was no exception. I found the fly hanging from a tree branch on the bank of the Beaverkill River. It was just a jumble of faded and almost unrecognizable materials on a bent hook. The sun caught what was left of its golden tag as the fly swayed in the breeze during a fishless afternoon. I drove to the Catskills that morning on my first real day off in more than a month, thrilled with the idea of having a little time to myself. In the back of my mind, however, I was aware that a Saturday in the heavily populated Catskills—smack in the middle of April—wasn’t the best place to seek solitude. Nevertheless, I persisted. Hook: Standard nymph or wet fly hook, sizes 16 to 12. Rear hackle: Brown hen hackle. Front hackle: Cream or white hen hackle. I traveled down the tree-lined, water-crossed backroads, doing my best not to become discouraged as I passed each spot already four or five cars deep. Not having a lot of free time, I drove until I found a place with no cars and just pulled over; this practice had become a way of life as I continued to work three jobs. A couple of weeks earlier, while passing through that same area, I stopped to collect a few samples of insects, and I was looking forward to testing my newly tied imitations. Taking in the early spring scenery, and working to finish my hot-gone-cold coffee, I came around a bend in the road that showcased a long stretch of open water. I hit the brakes. The place looked barren. There wasn’t a soul around. Well, at least I didn’t see a car; as for people, I’d have to take a closer look. I pulled over, shut off the truck, took a minute to gather my thoughts, and got out. Just as I stepped back to shut the door, I tripped over a stray cat that was hanging out in the gravel pull-out. I’m no expert on cats, but judging from the fact that it was busy marking its territory on the front tire while growling in my direction, I assumed that my heartfelt apology would fall on deaf ears. I slammed the truck door and the critter scurried into the bushes. I could feel its eyes burning a hole in my back as I made my way toward the back of the truck to get my tackle. As I got into my waders, the feline sauntered back and started acting up. It was time to get a move on before it started laying claim to everything else I owned. I hastily checked my pockets to be sure I had everything I would need, and took off toward the water, leaving my newfound friend playing with a beetle it had found. As I made my way upriver, stopping every so often to collect more samples of insects that I would later try to replicate, something caught my eye. About a quarter mile upstream, I saw birds swooping and feeding on a cloud of hatching mayflies. That was the place to be. It was party central! After setting down my rod, I swiped a couple of mayflies from the high grass and took a seat on the bank to examine them. I stared into the palm of my hand and realized that the patterns I tied the week before just might do the trick. I was ecstatic! I couldn’t wait to tie one on. As I continued analyzing the naturals in one hand, I reached into my vest with the other and felt the smile fall from my face. My pocket was empty. I dropped the insects and started pulling at my vest with both hands. There was nothing in any pocket. I had forgotten them. Not some of them, but all of them. Damn that cat! I know—it was my own fault for being distracted. Hook: Standard dry fly hook, sizes 16 to 12. Rear hackle: Brown dry fly hackle. 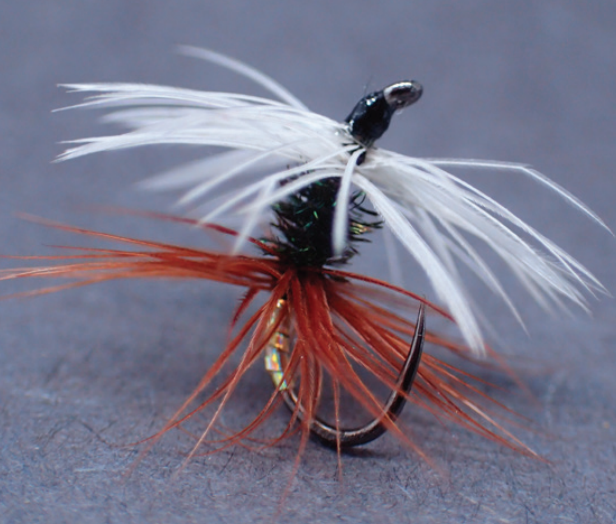 Front hackle: Cream or white dry fly hackle. Note: Tie this fly the same way as the classic Renegade, but instead of splitting the body into thirds, divide it into five equal sections. I wasn’t interested in hiking 40 minutes back to the truck—I had only an hour or so left to fish before I needed to head to work—so I decided to make the best of it. I took this as an opportunity to collect more samples and practice my casting. Desperation and boredom gave way to thoughts of cutting a bundle of hair from my head and tying a simple streamer on a sharpened earring loop. That might work. People have had crazier ideas. At some point I must have nodded off on the riverbank, because all of a sudden, I was jolted awake by the sound of a warning shot. You had to be kidding! It turned out to be a beaver slapping the water with its tail. As I lifted my head to stretch the knots out of my neck, something in a low-hanging tree branch caught my eye. I stood up to cut it down and take a closer look. It was a fly! I quickly sharpened the point using my hook hone, and straightened the bent shank using pliers. While it looked like a deteriorating dry fly, I have an undying love for swinging soft-hackles, so I quickly held the fly under the current to waterlog it. Next, I waded into the Beaverkill and started casting upstream. I continued casting upstream, letting the fly drift downstream until my line almost straightened out, and then flipped it back above me. I repeated this a few time before taking another step, and just as I lifted the rod tip at the end of one of my swings, I felt the unmistakable tug of a trout. After netting and releasing the small brown trout, I took a few more bewildered casts and caught two more fish before deciding to take a closer look at my fly. At that point, it clearly wouldn’t win any beauty contests. Hackle was unwinding at both ends, and there was an unrecognizable black material in the middle. The gold tag was sliding off, giving way to the rusted hook wire underneath. That found fly piqued my interest, and after attaching it to my hookkeeper, I packed up and headed to the truck. Hook: Standard dry fly hook, sizes 14 to 18. 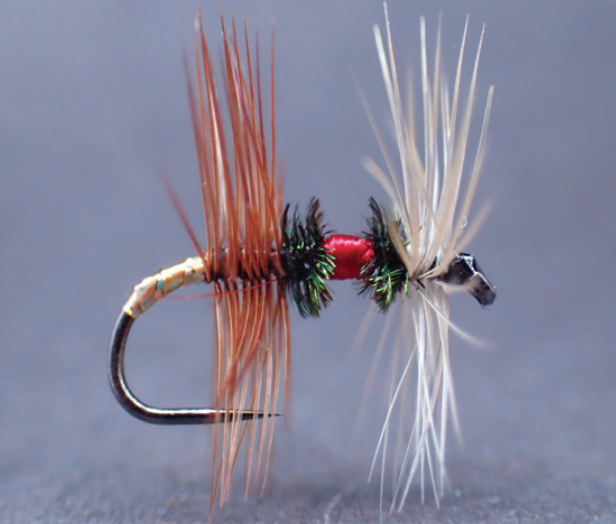 Note: I tie this fly in the smaller sizes to imitate midge clusters. One way to keep the correct body proportions is to split the shank into thirds. Let your thread hang at the next one-third mark as you wrap forward so you know when to stop. After returning home, I left the fly drying on my tying bench and fell back into the routine of my hectic workweek. I often spend sleepless nights behind my tying vise or buried in a stack of books, and with the mystery of this pattern staring me in the face, I couldn’t stop from taking it apart to get a closer look. Upon closer inspection, the pattern had brown hackle at the back end of the hook shank and cream hackle wrapped at the front. What I thought was dark dubbing turned out to be peacock herl. I placed everything on my bench in the order I removed it from the hook and made a list of how to retie the fly. With that task completed, I decided to retire my Annie Oakley decoder ring and make the pattern as a soft-hackle. Over the next month, I caught numerous fish using that fly and others based on the insects I collected, but the stuck-in-the-tree replica had become my new go-to pattern. Who came up with it? Does it have a name? What was it supposed to imitate? I still pondered those questions. One evening, while reading Masters on the Nymph, my heart skipped when I turned a page and saw my mystery fly staring at me—the Renegade. I was thrilled, and after a chance phone conversation with my friend Kelly, who confirmed that it was a Renegade and that she enjoyed fishing it on a regular basis, I did more research. Taylor Williams created the original Renegade in the late 1920s, and over the years, different styles of Renegades emerged. It is even said that the Renegade was one of Ernest Hemingway’s favorite patterns. It is considered a “fore and aft” style of fly, which means that hackle is tied on at two different locations, one in the front (fore) and another at the back (aft). I also discovered that there is more than one way to tie and fish the Renegade. 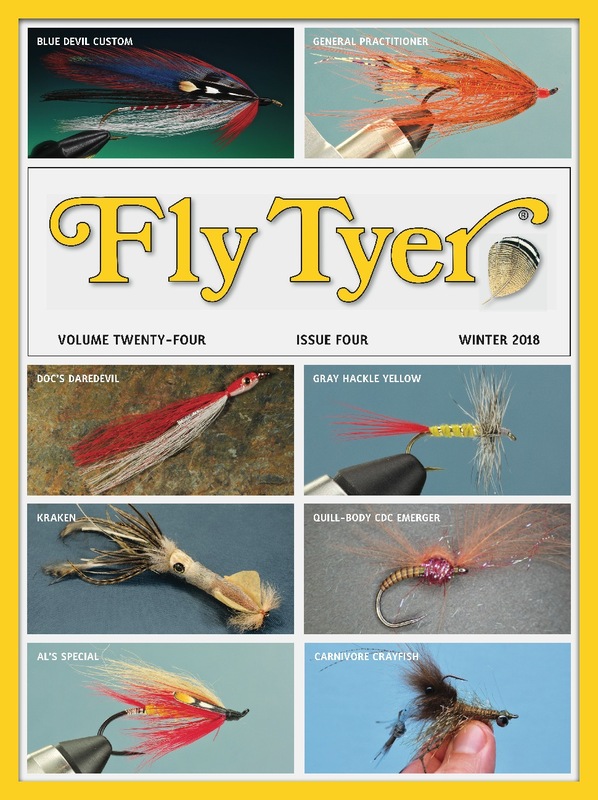 The fly I found in the tree could have been the dry fly version of the Renegade, but at the time, I opted to tie it as a soft-hackle, and it served me well as a subsurface attractor. I also began tying smaller sizes as dry flies to imitate midge clusters, and then moved on to the Double and Royal Renegade versions, which I fished as attractor patterns on faster water. While this might not be one of those weak-at-the-knee, shaking-in-your-waders, heart-pumping stories, it was a learning experience. We’ve all had bad days on the water, ready to snap our rods in half and curse under our breath. We’ve cut the thread from hooks halfway through tying flies because we forgot what order to tie on materials. But disregarding a day that doesn’t start off so well, or vowing the time spent behind your vise was wasted, hinders any chance of learning from those experiences. Better days will come and your hard work will pay off, sometimes becoming a memorable story. 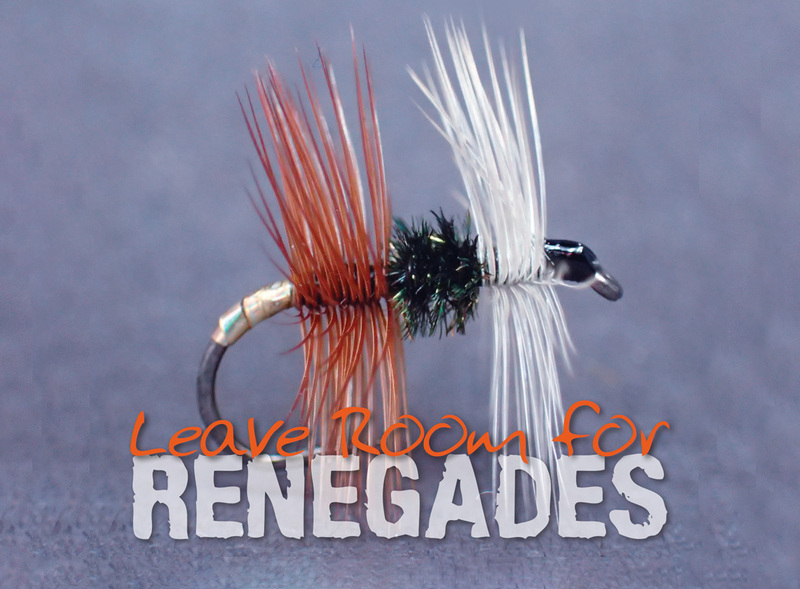 Whichever style of Renegade you choose to tie, I hope you’ll find a little room for this pattern in your fly box.